Trudy was my first build and is now going strong at 30 years old. She has crossed Bass Strait 8 times, including one memorable occasion when returning home from Wynyard she self steered for 27 hours with the tiller lashed and no one in the cockpit. ( Too Wet, ) She had sailed 10 miles off the rum line to windward, and headed for the western entrance instead of Cape Woolamai. She is a comforatble four birth boat that is simple to sail alone or with a small group. 'La Cage' . 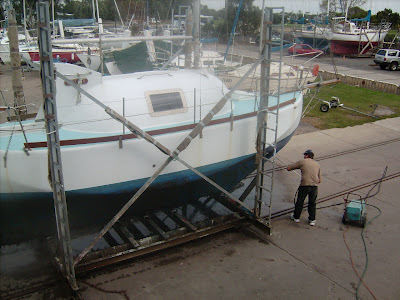 She is my second self built yacht which is a 40 foot vessel and has been on the water in constant use for over 5 years. A fine example of a complete vessel designed and built using the method to be documented right here. The dotted line shows the original Dorey Shape. This would have needed heavy ballasting, which I did not want if I needed to tow the boat with a trailer. I have added an extra chine for form stability. The drawing also shows a detatchable keel, to allow the boat to carry sail. Drawing of 32 footer with fixed keel. The comission is for a centre-board version. I personally dont like things that move. This model is 2 inches to the foot and shows how easy it is to add extra chines allowing the builder to create an instant shape. Chines being added to building jig using hurdles at widest beam and stern and bow rake. New commission for 32 foot cruising yacht, starting with a simple building jig, will be added in amongst the existing build feature. An extra chine has been added to the edge here to increase form stability. I have used the lightest mesh they make and there will be huge added buoyancy with the extra foam! In the early 70's I came up with an alternative method of boat building allowing a family on a budget to achieve their dreams without compromising on the quality of the finished product. This site is designed to share my plans and concepts with the world.